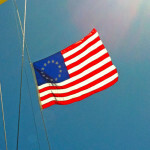 Golden Age of Sail to Come Full Circle? A Modern Tall Ship Cargo Vessel sans Engine! Olde World Sailing Line is dedicated to paying tribute to the “Golden Age of Sail”. A relaxing sail on a beautiful yacht like Lionheart , with its billowing sails, peaceful sounds, long graceful lines, and gorgeous bow sprit, reminds us of the lost days when sail power ruled the world. If some forward-thinking entrepreneurs are correct, the “Golden Age” may return to solve the some of the most pressing challenges of 21st Century world commerce. Tall sailing ships of the 18th and 19th Centuries were Europe’s lifelines to the world. Laden with wool, tobacco, spices, teas, chocolates, as well as gold, silver and human cargo, wind-powered vessels reached their peak during the 1800’s – a time that become known as the “Golden Age of Sail”. Surpassed by the advent of steam-power, the great sailing ships were largely abandoned by commerce and the military. As we move into the second decade of the 21st Century, around 90% of all world trade is conducted by commercial shipping. This is why a recent threatened strike by longshoreman dock workers would have such devastating effects – nearly everything on the shelves at Walmart, Home Depot, Lowes, and countless other retailers arrives to us by ship. The massive rate of global changes in economics, financing, energy, and effects of global warming make the current model of shipping unsustainable. Many shipping companies are declaring bankruptcy due to the soaring costs of fuel (costs have risen 400% since 2000). Added to high fuel costs are regulations that will require massive industry-wide changes and innovations. Shipyards will be compelled to produce more fuel-efficient vessels. In January 2014 regulations from the International Maritime Organization will require shipping companies to cut carbon emissions by 20% over the next 7 years and by 50% in 2050. If the shipping industry were a country, it would be the 6th largest emitter of greenhouse gases on earth. The current model is unsustainable. 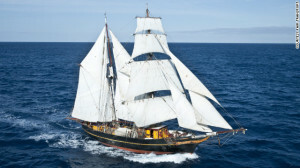 Last fall (2012) the 96’ brigantine, Tres Hombres, set sail from Den Helder, Netherlands to the Caribbean on an 8-month voyage carrying ale, wine, rum, and chocolate – much like her 19th Century protegees. Tres Hombres is “carbon neutral” – she has no engine and relies entirely on solar power for refrigeration and other electrics. All the cargo is organic, making it eco-friendly. Tres Hombres is an attempt to invent a green alternative to the fuel guzzling cargo vessels of the 21st Century and revolutionize world shipping. The Dutch once ruled the global seas, and so it is fitting that three Netherlands friends (and thus the name of the ship) launched this grand experiment to rescue world shipping (Anreas Lackner, Jorne Langelaan, and Arjen van der Veen). Co-Captain Van der Veen explained that “we chose a traditional rig because it’s a beautiful design and we wanted to show people sailing can still be effective”. Speed is not critical for all forms of cargo. There may be circumstances where time can be traded for environmental benefits and fuel savings. Way to go “Hombres”! God Speed. What do you think? Tell us about an opportunity you had to visit or sail on a tall ship? Post your pictures. In a following blog post, we’ll discuss some other concepts and sailing ship designs that show much promise for solving these global challenges. https://oldeworldsailing.com/wp-content/uploads/2018/02/Old-World-Sailing-Line-Logo.png 180 180 Captain Mac https://oldeworldsailing.com/wp-content/uploads/2018/02/header3.png Captain Mac2013-03-20 14:15:382017-12-14 05:38:25Golden Age of Sail to Come Full Circle? A Modern Tall Ship Cargo Vessel sans Engine!